Chicago’s students do not have to face the challenges described in this report. Inequitable justice policies, healthcare, housing, education, and job availability is the expected outcome of a system designed to maintain two distinct Chicagos: one for those with access to income and true decision-making opportunities and one for those left to navigate whatever is left over. The divisions present in this system could be mitigated by a series of political decisions. Lessening the opportunity gap and the resulting inequities is a question of political will. As mentioned throughout the paper, other cities, states, and countries have made the choices to address these challenges. It is up to Chicago to do the same. The economic changes needed to implement the policies are commonly portrayed as major, but proportionately, they are small. The Chicago metropolitan area has the economic activity of entire countries, equivalent in size to places like Switzerland and Iran. Chicago’s 2013 Gross Metropolitan Product (GMP) of $590 billion makes the Chicago area the third largest economic engine in the country (U.S. Department of Commerce, 2014). The CPS budget constitutes about 1% of that economic activity in real terms. To reduce class sizes dramatically, to provide for coordinated social services, to install air conditioning, and to ensure that students have teachers’ aides would take a shift of an additional 0.2% of the area’s economy toward CPS. The same logic could be applied to housing and healthcare – small changes would have major impacts on Chicago’s students’ quality of life and life outcomes. In other words, the money to fund these changes exists, and exists close to home. Acquiring the resources required for this shift is the test of political will. The political and business communities have already refused to reform the TIF program, tax equitably, or defend pensions. They have continually advocated for policies that further inequality in Chicago, a city that already has the same level of income inequality as the country of El Salvador (Florida, 2012, October). Any city is only as rich as how well it treats its most vulnerable residents. Clearly, Chicago’s students collectively deserve a much better deal than they have gotten to date. As the Mayor continually refuses to prioritize the needs of the collective over the demands of the few, it is incumbent on city residents to fight for the necessary changes. This report shows some of the opportunities to make that vision a reality. 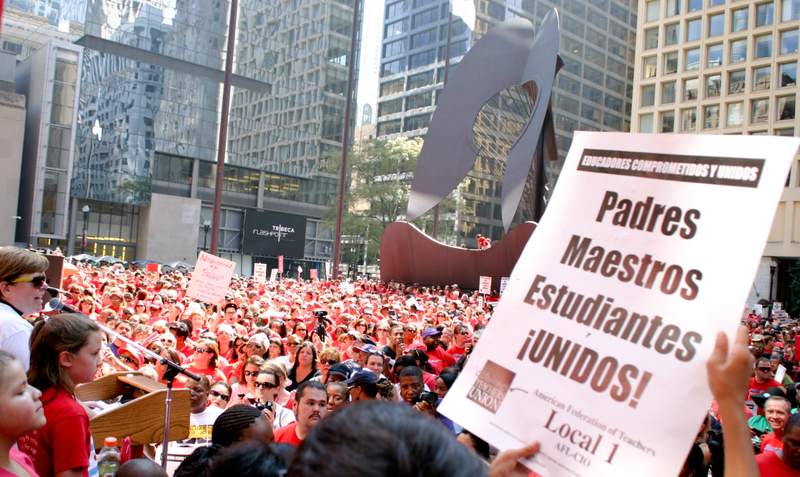 Join CTU in the continued fight for a just Chicago, the city our students deserve. U.S. Department of Commerce (2014). Bureau of Economic Analysis regional data. Retrieved from this URL. Florida, R. (2012, October 9). The high inequality of U.S. metro areas compared to countries. Atlantic City Lab. Retrieved from this URL.